Elegant dining without being pretentious. The facility is quaint and the service is excellent. The menu was diverse and the drinks were excellent. I loved the seating areas in the room. Bench style seating with fluffy pillows to an 18 person dining table in the middle of the room. The ambiance was romantic country and the rooms feel changed from day to evening. I would highly recommend this facility to anyone looking for a romantic dinner in the mountains. Absolutely charming - beautiful setting - interesting menu - wait staff and Inn staff friendly, professional, attentive - food was delicious and stylishly presented - a truly wonderful evening! A wonderful vermont country inn setting. Romantic, elegant, attentive and warm service ! Such a great combination ! The quality, presentation and taste of the food exceeded our expectations. The restaurant is a bit out of the way but well worth the trip. Best place for dinner in Stowe. 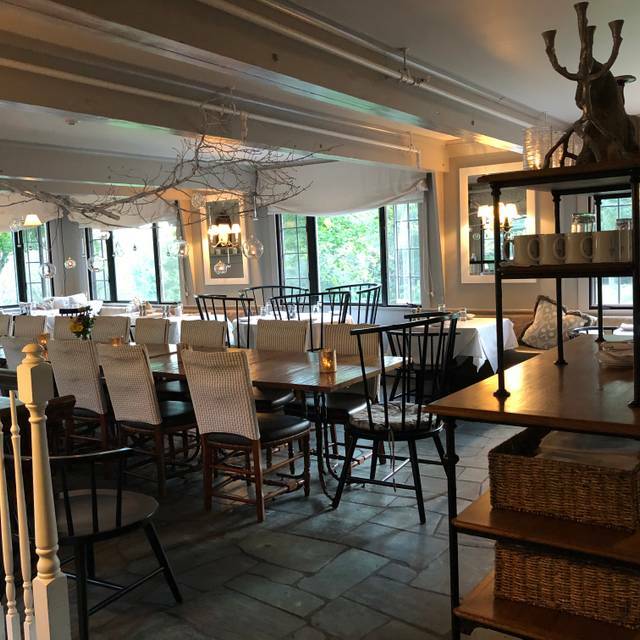 If you have only one evening in Stowe, VT go to Edson Hill, well thought menu, great cocktails, courteous service. have been going to Stowe for years and just discovered Edson Hill! Perhaps it was light falling snow as we arrived that amped the charm factor but when we went inside we were in love. Everything about the evening was amazing! The host greeting us, waiting in the living room by the fire, having a drink in the tavern and the dinner all were flawless. Not only would we recommend it but we what to go with friends and stay for a long weekend, I know they would love it too. Initially the service was non existent for the first 10 minutes. When we asked a staff member for a server to stop by, she presented a bit of attitude in her response to us. After that, the meal and drinks were wonderful! 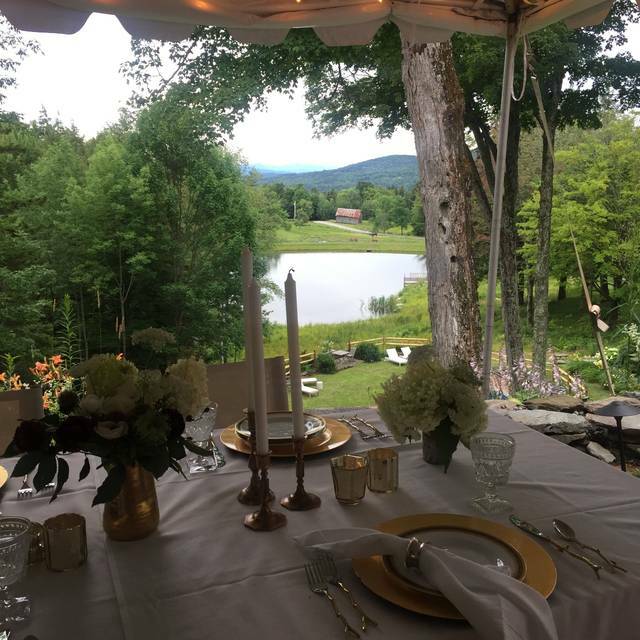 While the setting and ambiance are rich and beautiful, it was a bit of a damper when children of guests (who were staying in the actual house where dining is), ran into the dining area several times throughout our meal and were a bit loud, disrupting everyone’s experience. Amazing place and ambience. The building itself is just inviting and beautiful. Everything tasted fantastic with great presentation. Service was excellent and personable. Quaint location in a barn. Warm and intimate. Great food and friendly service. One of our favorite restaurants ever. My experience staying at Edson hill was absolutely amazing. The service and hospitality was unparalleled with anything else I’ve experienced. Our breakfasts were delicious and our one dinner was very good. The only constructive feeedback I would offer would be in regards to the burger, which did not have any discernible cheese on it. The tomato jam was delicious, and the burger was juicy, but I was looking forward to a cheddary bite. My scallop appetizer was delicious, but I feel it was a bit small- it came with 2 scallops-but the scallops weren’t huge. The presentation was beautiful and the sauce was delightful. Went to Edson Hill on a very snowy night and were one of two couples there due to the weather. Despite being in an almost empty restaurant we were made comfortable and served the most outstanding meals coupled with a great wine recommendation! Setting is beautiful yet while I was looking forward to it, the food didn’t live up to expectations. We went to the bar downstairs and that’s was a great spot for drinks. We were so looking forward to a cozy dining experience with long time friends - however, there was a large party of rowdy, loud and unto-themselves people at the big table in the middle of the dining room. Even after our subtle gestures for them to please quiet down, and a request to the waitress that she talk to them (which did not happen), the group continued to drown out our conversation at our corner table. I think that the waitress should have mentioned to them in a nice way that the group was being way too rambunctious for that small dining rom, or they group should have been in a separate room. It concerns me that if we come back, there might be this chance again that the middle table takes over the whole dining room. Not being able to talk in a regular conversational tone across a small table is not OK with me. I usually can go with the flow in most situations, but at a fine dining establishment, this is not the atmosphere that we were looking for. Otherwise, the food was delicious, and we loved the ambiance of the open fire in the living room to chat after dinner. On a date with the husband, we enjoyed a cozy corner table by the fireplace for dinner. Our server came right away to take drink orders and give tips on the menu. Great salad for me, but hubby ordered the fried Brussels spouts, which were delish, but enough for three or four starters. Dinner was lovely and ended with the light sorbet selection before we went back out into the cold. 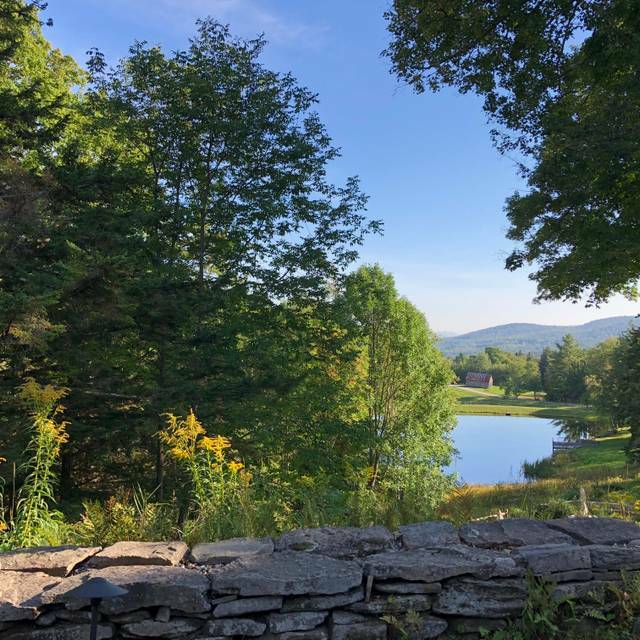 Edson Hill is a very special place, which we will always make time to visit when in Stowe. Bravo! Very cool building and the restaurant space was beautiful. Unfortunately, while we wanted to love the food, it was under seasoned and underwhelming for the price. The gnocchi with butternut squash, spinach, and sunflower seeds was flavorless and the oil poached salmon was tender, but blah. Our starters of the pork belly and seared scallops were delicious. Service was great and the wine list was terrific. We may have just made poor choices for entrees, but I would be hesitant to try again for the price. Amazing! Beautiful atmosphere and excellent food. Highly recommend. Amazing food through and through. Everything was top notch and the staff was super friendly. Beautiful location as well. I saw all the rave reviews and expected, with such a high bar, to be disappointed. I wasn't. I was wowed. When I walked into the cozy, inviting dining room during a snowstorm, I felt like I was transported to another world. The intimacy of the corner table on a wraparound couch with lots of pillows next to the roaring fireplace and surrounded on two sides by huge glass windows that allow you to look down at snow coming down outside through the trees was spectacular. The seared halibut over black rice and pomegranate beurre rouge was so outstanding that we'll be trying to replicate it at home. The Bailey's whipped cream on top of the chocolate pot de crème was such a great touch that other pots de crème in the future just won't be able to measure up. The food and beverage manager (I thought he was the innkeeper) described proudly in some detail how they make it. And, yes, this made me long for the days of white tablecloths (yes, it has white tablecloths) and plush surfaces that allow you to have an intimate conversation. Edson Hill is a gem. This place is Amazing! The grounds and restaurant are absolutely beautiful and the food is incredible with service to match. We are already planning to come back next time we’re in town! Staff were warm and welcoming and went above and beyond! Beautiful, cozy, delicious food and friendly staff. Wonderful food, atmosphere, service. We couldn’t have asked for a better evening so we went back for the second night in a row. Quiet cozy dinning with creative and elegant menu. Friendly calm staff that only appear when necessary and don't hover. One of the best meals and dinning experiences I have ever had. 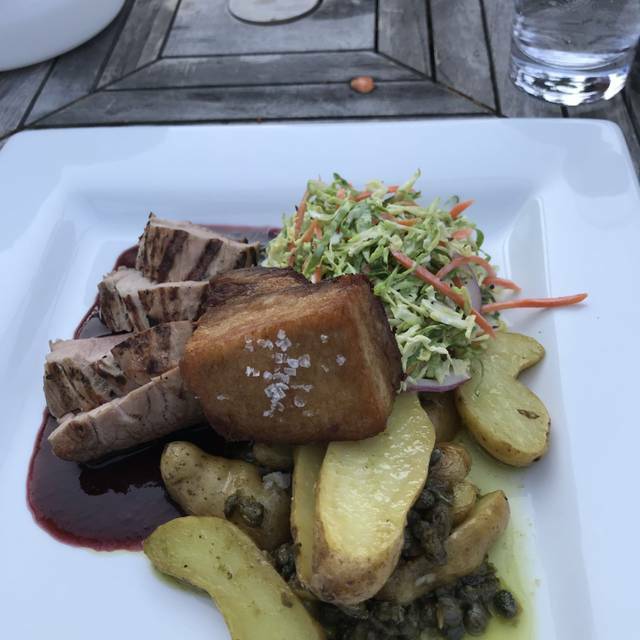 One of the best meals I have had in Vermont and excellent service as well. 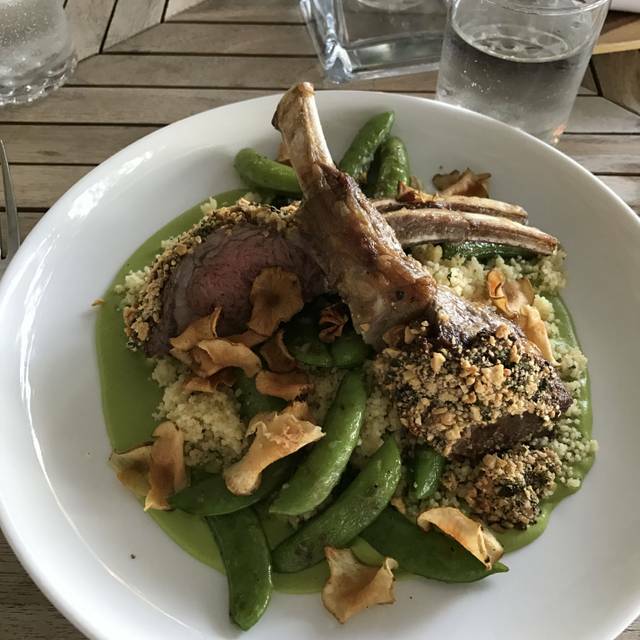 The execution and quality of food in addition to the gorgeous setting and ambiance make dining at Edson Hill a real treat. Looking forward to my next visit! Un lugar con una decoración acogedora, íntima y moderna. La comida acorde con la decoración. Wonderful place. Elegant quiet excellent service! Food was delicious! I had fish which was prepared to perfection! Hidden gem in Stowe! Great place! Edson Hill was a fabulous find in a picture perfect setting. The service was professional, food delicious, and dining room stunning. The sous vide apple salad was delicious and duck entree cooked perfectly. My husband loved his rabbit rillette and his halibut was well seasoned, and expertly prepared. Loved the Prosecco pear sorbet. All around a wonderful meal! We had an amazing time at Edson Hill. The food was delicious and the ambiance was perfect. We enjoyed it from start to finish! 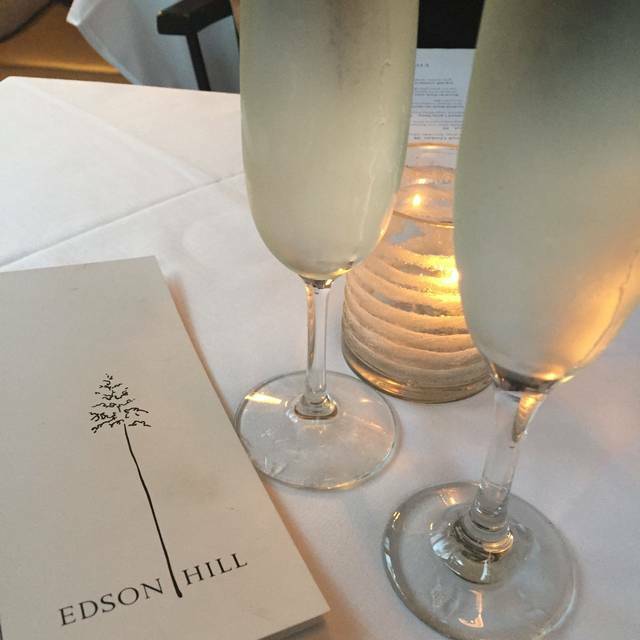 My wife and I really enjoyed our dinner at Edson Hill. Appetizers, Entrees, and Dessert were all delicious. Service was friendly and efficient, and we found a wine on their list that we hadn't seen elsewhere. All around a great experience. It was made even better by the time we spent downstairs in their lovely tavern before heading up to the dining room. This was possibly the most charming restaurant I have ever been to. The setting, the views, and the ambiance were completely spectacular. I enjoyed a seasonal cocktail, and we ordered a great bottle of wine. I don't have a huge appetite so it was nice to be able to order the cheese & charcuterie plate to share and then have the small plate of scallops (two), which were nicely done, while my husband had a steak. I finished with a tasty cinnamon apple pannacotta. We will definitely return. Fabulous restaurant for foodies! The menu changes with the season, is creative, and well presented. This is the best restaurant I’ve been to on a while! 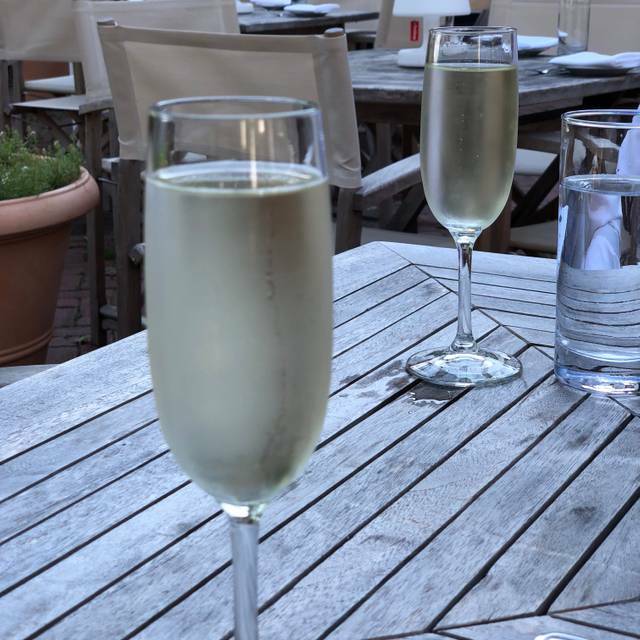 My husband and I had one big plate (gnocchi), two small plates (scallops and apple salad), dessert (apple walnut crisp) and two drinks and the bill was less than $100. You can certainly spend more but we left very satisfied We will return the next time we are in Stowe! Visited the Tavern and enjoyed a cocktail prior to dinner and really enjoyed the atmosphere there. Restaurant was lovely, new seasonal menu was very nice and wait staff were great with suggestions. Good wine list . Loved the restaurant and will be back hopefully in Stowe again.